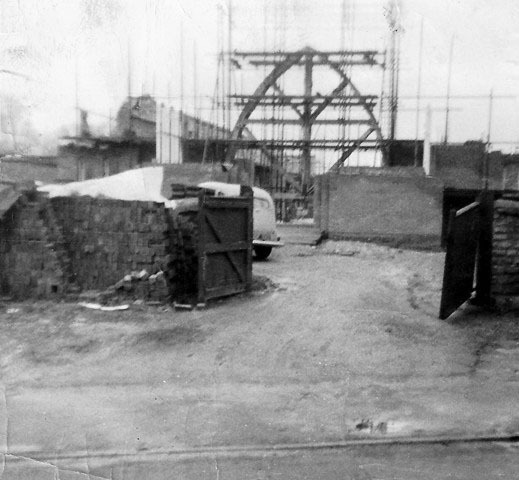 c. 1962 - Building the New Church. The photograph shows the present Church of the Immaculate Conception at a very early stage in its construction.The picture was taken from The Causeway looking towards what would be the front of the church. Set back from the footpath are the gates of the former Bonner's Stables (the gate on the right appears to have seen better days) and adjacent to the left-hand gate is a stack of bricks intended for the church building. Just beyond the parked car are what would become the main doors to the church while in the background, amidst a forest of scaffolding is the supporting framework for one of the main arches of the nave. Announcement in the Bicester Advertiser of the building of the new Catholic church – 6th January 1961. The construction of Bicester’s new Roman Catholic Church is expected to begin in early February. The church is to be built in two phases; the first, which will accommodate 350 people and take a year to complete, is estimated at a cost of £25,000. The site for the new church will be opposite the Parish Church at the rear of Henley House. The church has been designed by the architects, Arthur Fairbrother and Partners, so that it may be extended at a later date. An interesting feature of the first erection will be the sliding and folding screen, which when open, will allow the combination of two sacristies providing a large room for meetings or for use as a weekday chapel.